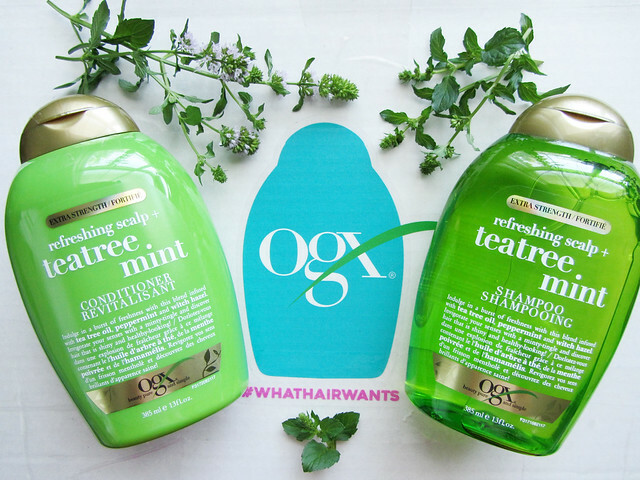 When browsing the shampoo aisle, you may have spotted those cute, curvy bottles by award-winning beauty brand OGX. A perennial favourite among consumers, OGX offers irresistible-smelling products to quench the body from head to toe. 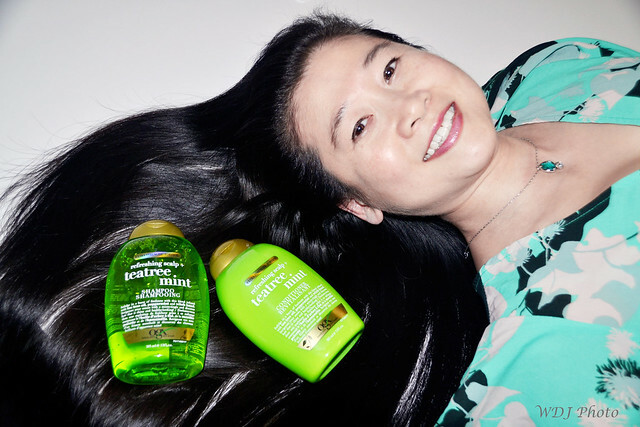 I was recently sent their Tea Tree Mint shampoo and conditioner combo for review. Tea tree oil has become tremendously popular over the years for its natural antiseptic, antibiotic and anti-inflammatory properties. 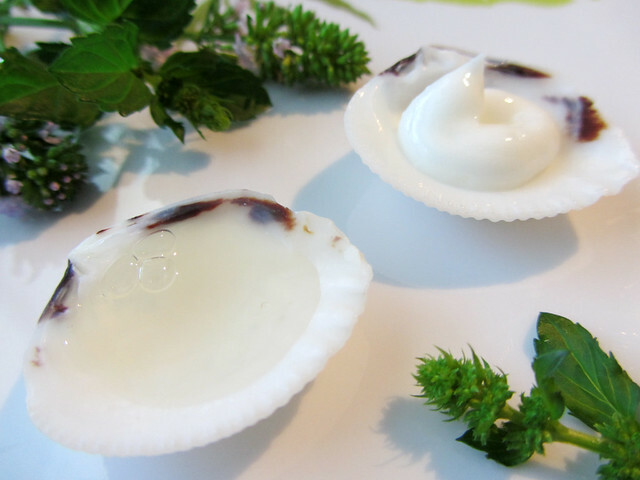 It’s been used to soothe skin conditions, heal minor wounds, repel insects and even banish mold when used as a fruit and veggie wash.
As a shampoo, I imagine that an insect and mold-free head would be very desirable! Kidding aside, tea tree oil works to unclog hair follicles and nourish roots while mint stimulates circulation on the scalp and helps to maintain its pH balance. In combination with nutrient-rich milk proteins, this OGX line also protects and hydrates hair. Although the OGX bottles are unique, I find them hard to handle and squeeze while in the shower, with slippery, wet hands. They are also inconvenient, not able to stand upside down so you can get at the last of the product. The shampoo is a clear gel with an earthy, slightly sweet and refreshing fragrance. It lathers well, isn’t overpoweringly minty and rinses squeaky clean. I’ve been indulging in the tingling sensation and delicious aroma, especially during our current hot, sticky summer days. The conditioner is a thick, rich cream with the same delicious scent. Last month, I reviewed OGX’s younger sibling, Maui Moisture and was delightedly surprised. I had high hopes for the Tea Tree Mint shampoo/conditioner combo but even after a week of use, I haven’t noticed any significant increased softness or hydration. Perhaps a longer usage period is required. Although OGX products contain no sulfates, they do not claim to be paraben-free, unlike the Maui Moisture line. OGX offers 20 nutrient combinations for all hair types and needs, including the ever-popular Moroccan Argan oil. Products are available in major drugstores across Canada and retail at around $10.